When you want to dry off a little bit we have three huge interactive arcades with high-tech fun and other games. We have the hottest new games plus many of your old favorites, some of which are redeemable for credits toward fun prizes. The Northern Lights Arcade is located in the Wild West region of the hotel on the 1st floor. Glitter Gulch is just down the stairs from the New Frontier Lobby. X-treme Adventure Arcade is on the 1st floor of Glacier Canyon Lodge, directly below the lobby. 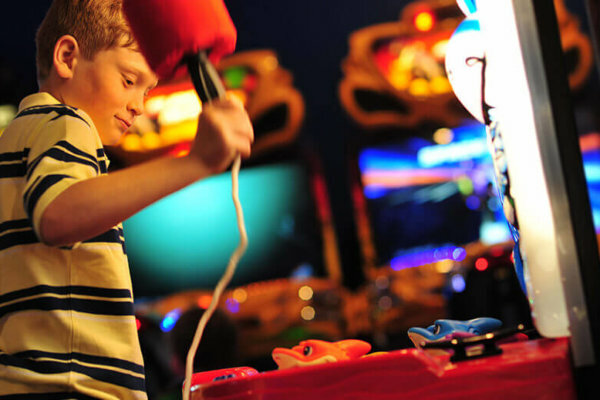 Green Initiative: Our arcades are transitioning from tokens and paper tickets to swipe cards! You can load your cards at a kiosk, and then swipe at the games. If it is a game that awards credits, any credits won will automatically load onto your card. When your stay is over you can redeem your credits for fun prizes. No more tokens (more hygienic) and no more tickets (less paper)! Yeah!